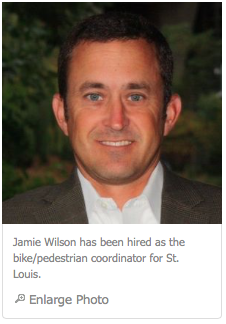 ST. LOUIS • Jamie Wilson, president of the local transportation engineering firm CBB, has been hired as the city’s first bike/pedestrian coordinator. Wilson, a traffic engineer, led the company’s traffic operations division. He oversaw the team that managed detour routes during the closure and reconstruction of Highway 40 (Interstate 64) and the intersection project wrapping up at Skinker Boulevard and Clayton Avenue. His duties will include coordinating bicycle and pedestrian projects and making streets safer for those on foot and bikes. His salary will be $59,774. Wilson, 42, starts work Monday.